Welcome to Your Kid’s Table! I’m Alisha Grogan, mom and a pediatric OT. 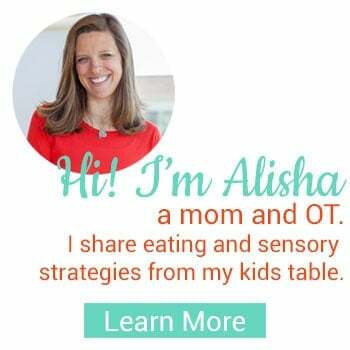 Here you will find eating and sensory strategies I use at my kid’s table, both at work and at home, so that you can try some of them at your kid’s table. 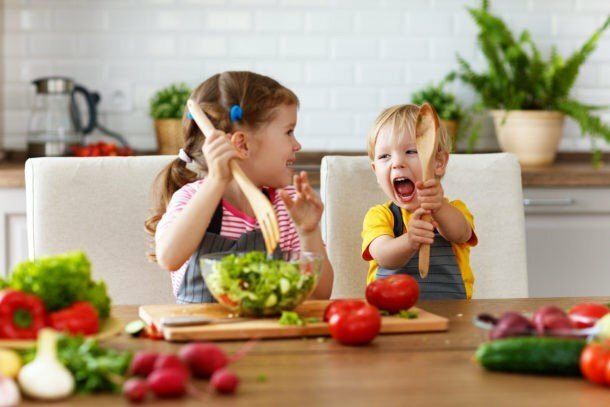 My mission is for Your Kid’s Table to provide parents, caregivers, and professionals working with children, reliable, realistic, and professional strategies to help them confidently and appropriately manage their child’s eating habits and sensory processing. At this point I have shared A LOT, and I know it can be a bit overwhelming to try and figure out where to begin. Let me help, so that you don’t feel too overwhelmed. ARE YOU LOOKING TO BEGIN CREATING HEALTHY EATING HABITS FOR YOUR CHILD, NO MATTER WHAT AGE? Then, find out how to avoid being a short order cook, this is my fundamental tip to avoid life long picky eating. Next, learn how to dodge common mistakes parents make and phrases that shouldn’t been said about food. You’ll want to ensure you’re offering enough variety of foods to maximize your child’s diet. Lastly, Print out a free one month menu plan here to give you some inspiration. DO YOU WANT SOME GUIDANCE ON HELPING YOUR CHILD THROUGH NORMAL EATING MILESTONES? 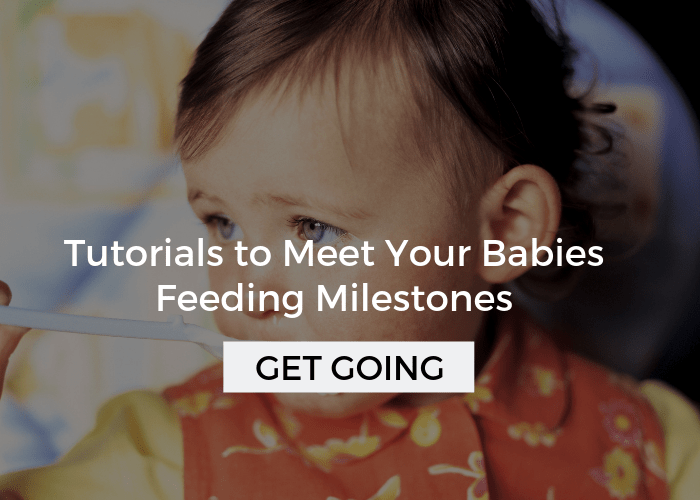 First, you’ll want to head to Feeding Milestones to find a guide for all your child’s eating related milestones, this gives you the big picture and tutorials for everything from straw drinking to starting finger foods to using utensils. 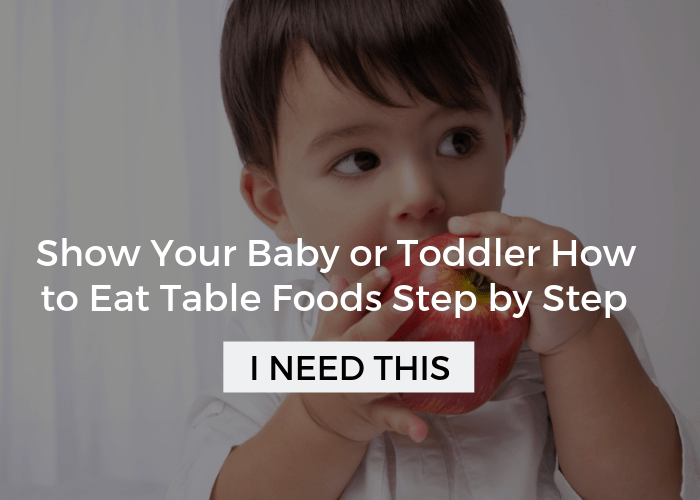 Next, learn how to stop worrying about if your toddler is eating “enough” and find out just how much they do need to be eating in Toddler Portion Sizes. And, don’t miss how to stop breastfeeding or how to stop bottle feeding, these weaning guides will save your sanity! Lastly, head over to Finger Food Ideas and Meal Ideas for babies and toddlers. These are two of my all time most popular posts, and for good reason! ARE YOU STRUGGLING WITH A PICKY EATER AND NEED SOME STRATEGIES YOU CAN START IMPLEMENTING, LIKE YESTERDAY? 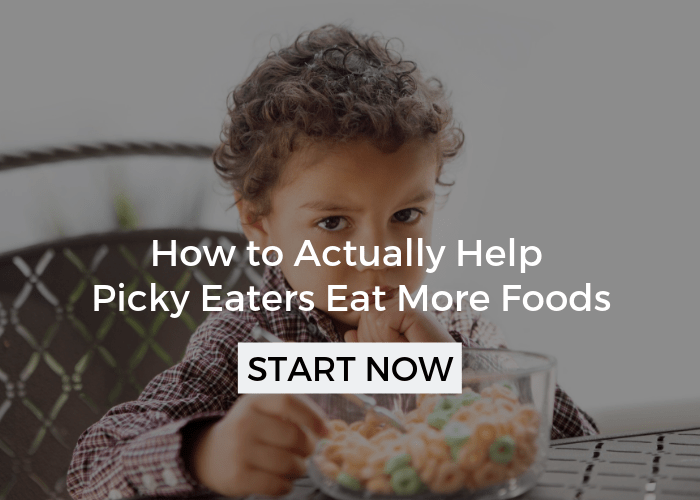 Start by reading The BEST Strategy for Picky Eaters (don’t miss part 2 either). This can be difficult for parents to hear, but I strongly believe this is a critical first step if you want to create healthy, lifelong strategies. Next, go through each strategy on the list of Eating Basics and begin to implement each one until they are all part of your routine. It is very difficult to make progress with picky eating without these all being in place, and often picky eating often improves (sometimes dramatically) on its own once you get them under your belt. Then, give some thought to what the underlying cause of picky eating is for your child with this list of 5 Reasons Kids Don’t Eat. Once you’ve checked off the first two steps you may need to address the root of the problem, which will now be much more effective. 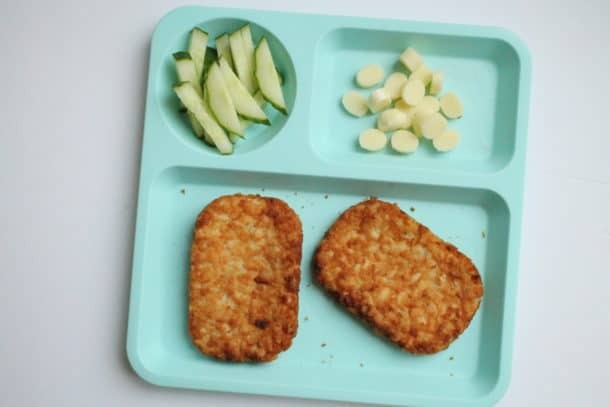 At this point you may be wondering how severe your child’s picky eating is, if so go to When has Picky Eating Gone too Far? Now that you’re ready to get specific, begin exploring new foods and building off the foods they are already eating. Add in some supplemental strategies like using dips, sticks, and cooking together. Lastly, if you need some more help, head over to the comprehensive online picky eating class: Mealtime Works. 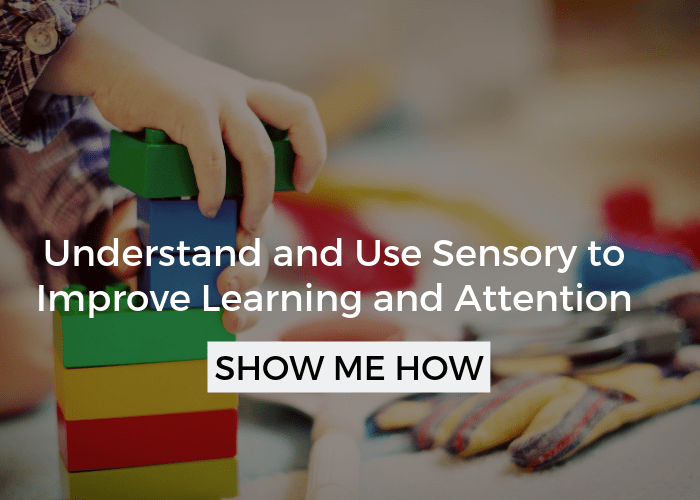 DO YOU WANT TO UNDERSTAND MORE ABOUT SENSORY PROCESSING, HOW IT AFFECTS YOUR CHILD, AND HOW TO HELP THEM? First, head over to the Sensory Basics page to get an introduction to sensory terms and activities. Did you see any red flags? Not a big deal! Find out what a sensory diet is and how it can help your kiddo! Next, you’ll want to check out over 100 sensory activities that you can start doing with your child, and teaching them to do themself! If you think your child is a picky eater and has sensory need then understanding how sensory processing and picky eating are related will be an important key! 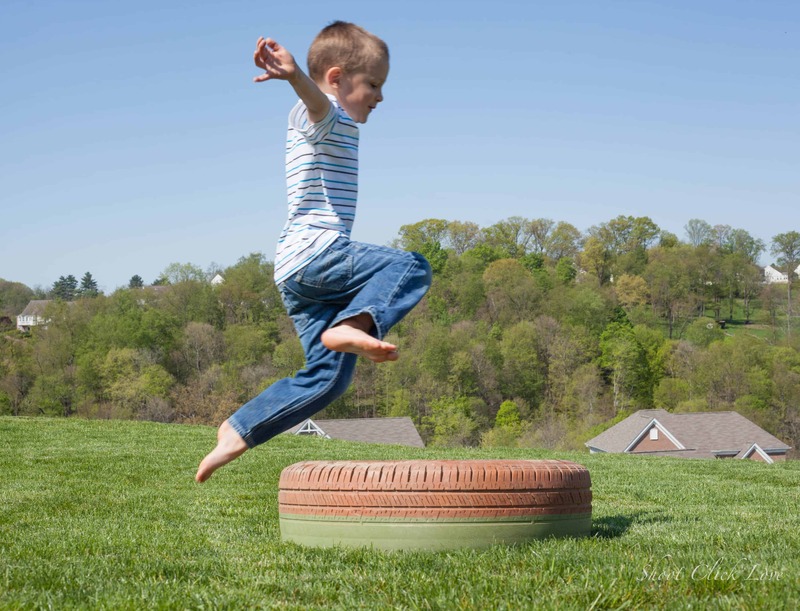 Lastly, you can dive a little deeper by honing in on your child’s sensory needs in Sensory at School, Sensory Strategies for Wild Kids, and Everything Oral Sensory. WANT TO SEE EVERYTHING I’VE WRITTEN IN ONE PLACE SO YOU CAN PERUSE TO YOUR HEART’S DESIRE? I’ve got you covered. Head over to The Your Kid’s Table Vault (aka:The Article Index) to see every post I’ve ever written, organized by category (picky eating, feeding milestones, sensory, recipes, and nutrition). If you’d like to know more about me, then you’ll find that on the About page, and I have to mention our Resources page because there you’ll find all of my favorite eating and sensory tools and toys. Lastly, to make sure you don’t miss anything new, sign up for the weekly newsletter below, when you do you’ll get a FREE PRINTABLE, How to Improve Your Kid’s Eating in 9 Steps!